Every summer since I was seventeen, my father and I have been taking trips across the country. Our internal compasses have led us to explore lands far and wide, and to fall in love with our country with each and every mile. Once we left the familiar, lands opened up and the terrains became ever-changing. One day we would be riding in flat plains, the next we were surrounded by mountains cradled in white clouds. Last June, we traveled from Florida to California, and cut over to Missouri before we headed South back home after a month. We spent many miles through desert landscapes on the first half of our trip. The Mojave demanded that we stop every thirty minutes to douse our white shirts in our coolers of ice cold water. A few days later as we headed East into Colorado, we received a suggestion from a friend to ride the “Million Dollar Highway”. Without any expectations (or preparations, really) we made our way there, passing through Durango and heading North by Highway 550. As the rain began to fall, the temperature started to drop. Our surroundings abruptly changed as we trekked north. Before we knew it, we were scaling the mountains. Since we were traveling in the summer, we hardly expected to run into temperatures below 70F (21C). 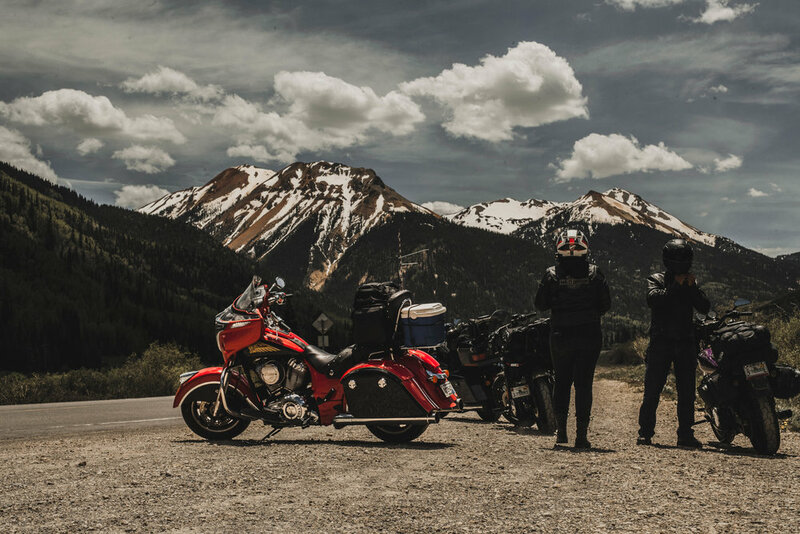 We packed rainsuits (mine was not particularly good quality) and our riding jackets, but beyond that we were not prepared for the Colorado mountains passes. The rain began to fall and did not let up for the entirety of the ride. With close to freezing temperatures, the water that began to build in my seat, boots, and fingers felt like extreme burns, and I almost came to terms with having to have my phalanges amputated. I kept riding, and did not want to stop and miss out on any part of this experience. It wasn’t until my dad pulled off that I came back to reality and heated my hands and feet by hovering over the engine and transmission. 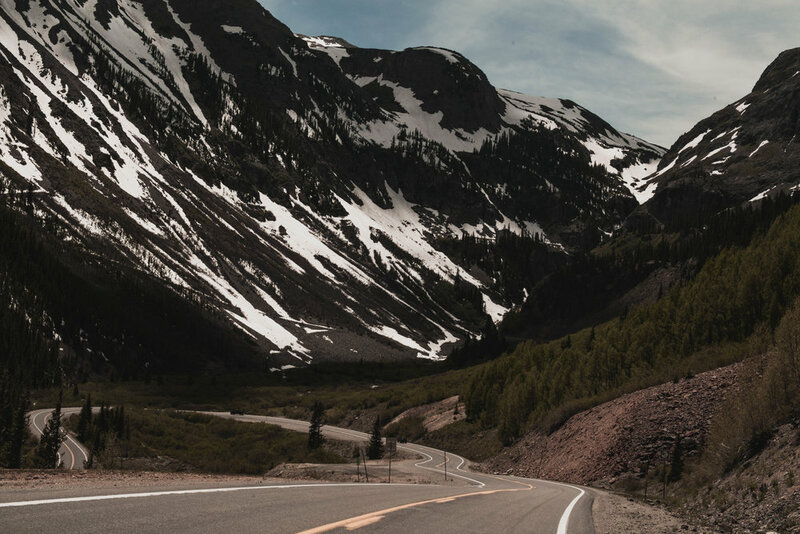 The Million Dollar Highway itself is approximately 25 miles long (40km), and spans three different mountain passes from Silverton to Ouray, Colorado (Coal Bank Pass at 10,640 ft (3.2km), Molas Pass at 10,970 ft (3.3km), and Red Mountain Pass at 11,018 ft (3.4km)). The ride demands all attention as its hairpin turns come one after the other and there are no guardrails to save you from a plummet if you make a mistake. With the weather, we were especially careful because of the hazard of black ice to appear. Also, my motorcycle being carbureted and jetted for Florida (near sea-level in altitude)* was full-throttle and still trying to maintain 35 mph (56kph), so I didn’t have much of a choice but to take my time. The mountains send you straight into the clouds, with stunning views of white-capped mountains and steep waterfalls in the distance. The plush greenery blankets the mountains, and it truly does feel other-worldly. The surrounding historic mining towns offer tourists warm meals and conversations. Ouray, CO even offers warmer hot springs for you to wind down after a long, cold ride. If you haven’t already, jot this ride down on your bucket list. It’s ranked as one of the Most Dangerous Roads in America, and is rightly so. If you are afraid of heights or are faint of heart, either mentally prepare yourself or choose to sit this one out. What to watch out for: wildlife, falling rock, hairpin turns, weather conditions and slick roads, oncoming traffic, and turn-offs that are mostly gravel and dirt. Also, prepare to be awe-stricken by the most spectacular views Colorado has to offer. *as altitude increases, the effective amount of oxygen decreases, thus the motorcycle will run richer at high altitudes (more fuel than oxygen in the mixture) causing a poor running condition.